Tuck Valentine - Pansies with Silver and Gold Embellished Leaves and "Good Wishes.". Baseball Valentine - "I Hope I HIT The Right Spot in Your Heart"
Colorful Edwardian Valentine Card - Side View of Woman, Verse "To One I Love"
Rose O'Neill - Kewpies Valentine Post Card "Box Full of Love"
Nister - Double Heart Valentine with Winged Cupid Holding Torch, "My Heart is Burning As You See." Valentine Post Card - Boy Holding Spoon and Fork "Can She Cook?" Boy Holding Spoon and Fork "Can She Cook?" Man in Black Tuxedo holding Music Sheet Singing "I Love You." Music Valentine "As a Matter of Record, I want you for My Valentine". Carrington. Chicago, IL. This is a die-cut valentine that can stand on its own. It depicts a young girl in a plaid dress, playing a record on a record player. At the bottom left edge, there is a heart with the saying, "As a Matter of 'RECORD' I want you for My Valentine". There is some light edge wear and an inscribtion on the back of the card. Otherwise fine. Measures 6" x 3 1/2". Top left is a blonde girl with pigtails dialing the phone looking for a ring. Top right is a girl roller skating carrying a special message. Her Scottie dog is at her feet. Below a boy croons with a large microphone. . He has a big yellow bow tie with red hearts. The verse reads, ? I?m not SINATRA I?m not BING but for you Valentine I sure can SING.? The final is the timeless teen on the phone. Condition: excellent. Pencil inscriptions on reverse. Heart shaped valentine, applied parchment with clover leaves and flower design held in place with rivets. Clover flowers held in place with rivets with a pretty young girl dressed in green at center. A sweet young girl in yellow and blue finery stands beneath a horseshoe wound with forget me not garland accented with four leaf clovers. A die-cut kitten stands atop a double opening red honeycomb ball of yarn. An 8 pp booklet with embossed heavy stock covers. Art Nouveau Influenced cover design with poppies and flowing greenery. An applied die-cut at center of girl while seated among the giant violets. An anonymous rhyming valentine verse within. In-text and full page color illustrations of a young girl harvesting violets and later holly. Also includes scene of cats and kitten playing London Bridges --most unusual for a book of this nature. Condition: s excellent. A charming paper doll valentine – a 10 ¾” die-cut chromolithograph scrap torso of a young lady holding a song sheet. Art Nouveau influence with tulip and rose background and applied iris on parchment, held in place with rivets. Brundage girl with hoop. Die cut Victorian push cart with roses, love bird and honeycomb. A single fold embossed valentine with an applied scrap depicting an array of spring flowers. A small floral scrap that reads, “Truthful.” Condition: small area of discoloration upper left. Scrapbook residue and pencil inscription on reverse. That writing in albums is like working for wages." "Live so you will not be afraid to die." If you would reap a good harvest, sow good seeds. Little by little, in God's Book, we fill a leaf. Eternally in the "New Jerusalem" may you dwell." I get my Mother to." There are three illustrations in the album. One of the illustrations is a bird in flight carrying the name card of the artist. It was done in ink. Another is again the name card of the artist, but with a tree branch behind it, in ink. The last is one is painted in green, red and pink. It shows several small flowers in various stages of bloom. Measures 6 1/4" x 4". https://goo.gl/photos/FZaDZghaQsKk7NDM6. The covers show some minor edge wear due to rubbing, mainly on the corners and the back strip. The color of the embossing has also been worn off in some places. One of the interior pages has tape repair. Minor soiling due to age. Text block is semi detached from boards. Three part 9” die-cut valentine with baskets of roses, cherubs and sail boat masts. A lace paper only applied to what was once the top of a valentine. It is unidentified, but elaborate lace paper with gilt embellishment. This is topped with an applied silk ribbon border and a center cartouche with embroidered silk roses captioned “To My Friend”. A 5” x 3” elaborate and intricate lace paper with Cupid in a sail boat as the center cartouche. C1860s. A stove flue cover with a lithograph of a pair of winged cherubs or angels sitting in the clouds. Lace paper valentine with gaudy inside page displaying through lace. Popular 1860s - 70s style. A 19 leather strip charm string valentine. Each of the hearts has a pyrography border. The text reads "If of me you'd cease to think my heart would shrink -- and shrink -- and shrink -- and shrink -- and shrink. Light wear. .
than with a brawling woman in a wide house." I write my name just for shite." One last hidden gem in this album is a full page ink illustration depicting a ribbon among flowers. The piece is expertly rendered and even appears 3D. This item is an Aldine Autograph album, and among the pages are ten printed 'decorated spaces'. There are a total of four different illustrations: a bird carrying a flower (repeated 3 times), a lily floating in a pond (repeated 3 times), birds flying under a bridge (repeated twice), and a flower boarder (repeated twice). Measures 7" x 4 1/2"
https://goo.gl/photos/Z7ZcWR8qqcChCkn46. Rubbing on covers, Interior pages are loose in the first folio, some detached. Text block is semi detached from boards. Octavo Lace Paper Garden Scene Valentine with Gilt Embellishment and Dresden Birds in Nest with Eggs. Windsor or Wood. An octavo size valentine with lace paper cover backed with fine silk mesh and watercolor red roses with green vines and gilt embellishment. It depicts a woman standing in a garden setting. A single-fold printed color lithograph illustration of lovely woman seated in rose garden. Enhanced with watercolor on roses and ivy border decoration. The verse begins “Would I might kiss that crimson lip... Inside blank. c1850s. Envelope folds, otherwise fine. (Lane it was, but now a river)"
Underneath the Lane called Worcester"
Alfred W Parker (1845? -1917) was a inspector of structural steelwork who worked on the Boston Subway system. He also helped to design a power rod bending machine. Measures 8 3/4" x 7 1/2". I hope you'll kindly find an owner. A pretty young girl gathering flowers in her apron with a love bird at her side. Front tier is a blue honeycomb mushroom, adorned with cherubs. A 2 1/4" x 11 1/4" silk brocade ribbon with a2 1/4" x 5 1/2" punch paper cross-stitch sampler stitched atop the ribbon. The sentiment reads "I will ever Love thee Horace. LeSlie." A small book or token box at the base. Twenty-two (22) punch holes per inch. . But flowers alone may grow. "All going to Brother McKinley’s church, and you to stay at home and get dinner." Ware breaks heads and love breaks hearts." Perhaps not to meet till on high. The album itself is brown cloth over boards with stamped decorations. The front cover has two horses, gilded flowers (gold has mostly faded) and green painted basket weave in the top right corner. The back cover has a stamped bow made from ribbons and tassels. It appears as though Matilda hand colored in the titled page of the album, which simply states “Autographs” with a gold ink. Measures 7” x 4 1/4"
A Revolutionary era gentleman on bended knee with a large package captioned ‘From Heart to Heart’. It opens to reveal a row of love birds and blue birds amidst vining roses. A small paper honeycomb at front. This fine lace paper embossed die-cut envelope is marked "Mansell". The entire envelope is lace paper. Within is a gilt enhanced replica of the cover design with a courting couple at left and a cartouche backed with a printed silk verse entitled "A True and Devoted Heart". Hand penned at the base of the verse is LIke Thine Dan. "We will always be friends; Little blue-eye" is penned on the front of the envelope. Measures 10 1/2" x 7" when flat. Few dots of old glue residue; otherwise fine. A 5 1/2" x 4 3/4" paper heart with sawtooth border, edge and center with triangle cutwork, with pinprick border design. What at first appearance looks to be a love poem turns sour. The verse reads "Venus herself is not more birght Or lovely to the view, Her Skin is like the lily white, Her eyes a heavenly blue...Tis true with sympathetic arts You once procur exchange of hearts, But since with love no more I burn, Mine I'll take back and yours return". Light wrinkling and wear. A 7” x 4 ¾” embossed die-cut valentine with elaborate gilt enhanced lace paper in a mirrored shape hinged to the front. Embellished with feathers and a silk flower. A single-fold valentine with fine lace paper cover. A hand colored lithograph at center depicts a light stepping or dancing gent in a garden. It is captioned “Who can behold thee dearest, and not love”. Inside blank. No maker noted. Also includes embossed envelop addressed to Lizzie Bassett, Worcester, Mass. Condition: small corner chip upper left. Overall excellent. c1850. A 9" x 7 3/8" hand colored lithograph. It is titled "A Victim of Woman's Rights". It depicts a gentleman in an apron with his hands in the wash tub while a disapproving wife looks on. It is captioned "That's right, Old Dad, stir up the suds, And haste to purify the duds; But ere I'd have a wash-tub lover, I'd take and whitewash him all over". Letterfolds and discolorations. 1860s hinged box valentine with Cameo scrap of woman holding dove. A single-fold 5"x 7" valentine with intricate lace paper cover with floral patters and Cupid above the cartouch. A Dresden scrap with butterfly surrounded by a heart floats at the center of the cover on silk mesh backing. Inside applied verse shows through silk mesh. Purple wafers at base corners and center top. Applied verse withing titled Accepted Love. No maker identified. Few specks on front lace margin and reverse; overall fine. A friendship album from the late 1880s belonging to Minnie Brutsche, a child of German immigrants. The album was given to Minnie by her aunt, Lena Brutsche. The album is full of notes, poems, and quotes from her friends and family. Approximately half the album is in German, including notes from her mother, father, and husband. There are several original acrostic poems that spell out Minnie's name throughout the album, one of which is in German. One note that at first glance appears to have been written by a child, was actually written by an 86 year old woman (she notes her age below her signature). There is even a pressed flower tucked in-between two of the pages. There are variety of illustrations in the album. There are two sketches done in pencil - one of a bunch of flowers, and the other of a sailing boat. Additionally there are three ink drawings of a dog, swan and an owl done by the same person. What is one of the more remarkable pieces of artwork in the album is a watercolor done by Minnie's brother-in--law, which features a theorem style floral design inside a decorative boarder with a quote. There are about 10 embossed Victorian cutwork scraps (many with wear), mainly floral designs. What is the real treasury in the album though are the floral transfers that can be found throughout. They range in size from about an 1 1/2" tall to 5", and there is just shy of a dozen of them scattered throughout the album. Lastly, there are often short notes from Minnie herself. There are some notes regarding the relationship of the individual to herself, or their career (there are two notes with the phrase 'in candy business' added to them). Additionally Minnie sometimes traces a faded date or phrase. On the two notes written to Minnie by her brother-in-laws, she notes when they died and the age they were at the time of death. The covers are a tan crushed velvet, in a design meant to resemble an animal hide. The interior pages are gild-edged. Measures 8 1/4" x 5 14"
"Dear Cousin will you accept this book, Ts all I have to send, And as often as you read it Please Remember your friend. Eliaz Ann Nittleton To her Cousin Ann Nettleton." A 1 5/8" in diameter paper covered wafer box with an embossed seal or wafer at top center Contents includes 9 wafers 1/2" in diameter that would have been affixed to the back of the letter perhps with the seal. Also includes is a 5/8" circular cut-out photograph of an elderly women. Wafers of various styles, all embossed. A hand colored lithograph printed quarto valentine depicting a stately gentleman at the garden’s gate being advised by Cupid. Dear John, Should misfortune on you fall and the cold world pass you by and still proudly stand the test and meet each Scornful eye or should any dare to whisper a word tho name & would it back to those from Whence it came. Accompanied by an envelope addressed to John (illegible last name) Mount Pleasant, New Jersey. Letter sheet measures 6" x 4". Letterfold. .
Quarto Color Lithograph Valentine with Eggwash Hand Finish Depicting Courting Couple in a Garden c 1840. Finely embossed lace paper w color lithograph eggwash hand finish depicts an early Victorian couple while strolling through a garden – he plucks a pink rose matching her costume. A 2 3/4" x 3 3/4" letter sheet with intricate embossed border design. Lithograph of the music and first two verses for "The Kiss, Dear Maid!" Music by Beethoven. Verse by Lord Byron. Reverse is blank. Rock & Co. London embossed at base. An 8" x 10" single-fold valentine with finely embossed decorative device border design. Brightly hand colored decorative elments surround Cupid floating above a rose, lily, forget-me-not and butterfly. Printed verse begins "How may my heart its feelings prove" and concludes "Thou art my lov'd one--smiling Maid!" Inside blank. Paper by Burk, c1850. Condition: minor toning left margin; overall fine. Dear Plaited Hair Family Keepsake. ..
A 2 1/2" x 4 1/2" piece of paper with six (6) different hair ornament remembrances from FAther Mother, Sarah, Emma, Marion and Hatty. Each a slightly different design. Marion's circular plaits are adorned with a saw-tooth cut paper heart. No further identification. c1860s..
A 13 1/2" x 10 3/4" card with illustrated calligraphy reading "Our Darling Elsi __ Mors Janua Vitae--Talitha cumi" Translating to Death is the gateway to (everlasting) life -- and Little maid, arise (a Syriac or Aramaic expression. Crests of Agnus Dei and IHS. Adorned with dried forget-me-nots, daisies, fern and lily of the valley. Well executed in vibrant colors. Reverse has pen and ink of The Ruin - Mt. Edgcumbe. with a Milton verse. Dated Aug. 24, 1887. 32pp. Pictorial hand colored wrapper. Includes 88 numbered sentiments for writing valentines for any (male) individual. Perhaps numbered for the ladies of leisure to advise her writer which valentine to pen. Measures 4 1/2" x 3". Significant wear with old repairs to cover. Not found OCLC (5/2018)..
A 2 1/2" mirror-image cutwork with Pennsylvania Dutch love symbols including paired flowers, birds and hearts. Naive and dear..
A 4 1/4" x 2 3/4" intricate and delicate cutwork presumably from France, created by nuns in the 1780s or 1790s. Note the razor slits and pinprick at base. Watercolor decoration with AB or NB seated on a green grass with flowers above. The reverse has the Eye of Providence above a Flaming Heart atop the landscape. Intended to foster good will. . Still with thee I am happy, I love and be loved. Till summoned to mansions in heaven..."
On the cover there is gilt stamp which states "Religious Album" along with the original owners name, "Eliza". There are six black and white engravings (including the title page) depicting religious scenes, such as when an angel appeared to the shepherds to proclaim the birth of Christ. Brown leather board covers with gild stamp design. 60 leaves, with interleaves in front of the illustrations. The pages are multicolored, and gilt fore edge. The journal is approximately half filled (first half of book). Measures 7 1/2" x 6"..
An oval frame houses a 4 1/2" x 4 1/4" horseshoe shaped array of flowers created with hair. Each intricately woven into various types of flowers. Penciled numbers on the white background. A sheet applied to the reverse reads "Presented to Adam Van Allen, January 1, 1866 by Rebecca S. Van Allen. Manufactured from the Hair of Mr. and Mrs. Adam Van Allen and their children". A key follows assigning a number to each family member corresponding to flower created using that individual's hair. Frame measures 9 1/2" x 9". Crack in frame with old repair. Some gesso beadwork trim lacking. In 19th C America, parlor walls were decorated with elaborate wreaths made of hair fashioned into twigs and flowers, often adorned with beads or ribbons. Victorian men and women treasured hairwork not only as remembrances of loved ones and memorials of relationships but also as objects of beauty and means of personal expression. These works were created almost exclusively by women in cottage industries. In her book "Love Entwined" Helen Sheumaker argues that this refiguration of a loved one's hair into a commodity created a unique meeting point between sentimentality and consumerism, intensifying the close relationship between the goods one purchased and the kind of person one wished to be. Cupid's Bower Hand-colored Advertisement. 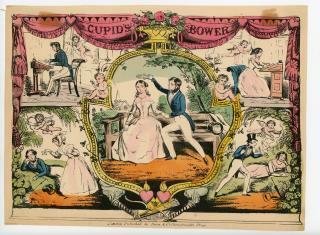 ..
An 8" x 10 3/4" advertisement for "Cupid's Bower". Official title - Cupid' s bower, or The poetical garden of love: a collection of original valentines calculated to convey the sentiments of the heart in language neat, chaste, and expressive. It features a courting couple at center seated on a bench as he applies a floral wreath on her head. This is surrounded by four (4) vignettes of courtship - with Cupid playing a hand in each scene. Hand colored.. Friendship Album: Sketches, Watercolors, and Poetry, 1915-1916. .United Kingdom. Also Included is even a needle and thread with the line "A stitch in time, saves nine." Measures 8 1/2" x 7 1/4". https://goo.gl/photos/9Jdw4rquwvVrJvAc9. Covers show minor wear due to age and rubbing. Bind is loose, with a few pages semi-detached. There is edge wear on the bottom of the backstrip, and the top is missing a portion. That missing section continues onto the back cover.